A “terroir” is characterized by the association of four different components: the climate, the topology, the soil and the vines. The climate at Château Fonvert is typically mediterranean, with dry and hot summers, quite dry winters, and cool and quite humid autumns and springs. 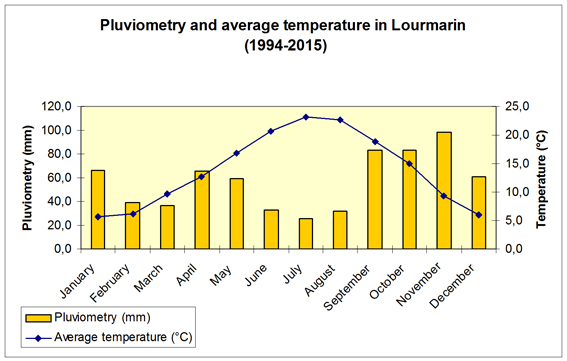 The Luberon mountain has a cooling effect. Cool nights are favorable to the polyphenols (tannins and pigments) synthesis in the berries. Thus, it secures the natural acidity of the grapes and ensures the delicate balance of the wines. A low level of rain, especially during the summer, induces a moderate water stress into the vines, which is optimal for the quality of the grapes. What’s more, a dryer weather limits the development of the vine fungus (mildew and oïdium) that need water to propagate. Therefore, it enables a reduction of the phytosanitary treatments, which are now, at Château Fontvert, exclusively organic. The mistral wind, frequent and quite strong at times, dries the grapes and the leaves quickly after a rain or a morning dew, and so contributes to the limitation of fungus propagation. Thanks to its favorable location on the Southern side of the limestone Luberon moutain, numerous hillside parcels of our vineyard benefit from a south or south-east exposition, ideal for a perfect grape ripening. 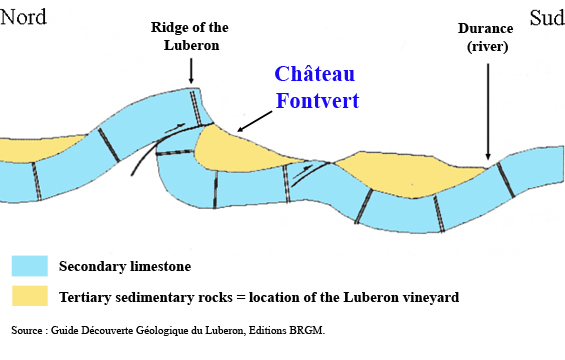 The central Luberon mountain is a great limestone bar, reaching 1125 meters (3700 feet) and spreading over about 60 kilometers (37 miles) from Manosque, in the east, to Cavaillon, in the west. On each flank of the bar, sedimentary rocks such as molasses, sands, zaffers… are to be found, deposited during a marine submersion phase wich took place at the end of the Tertiary era. soils made of calcareous molasses: conglomerate of pebbles, gravels, sands and silt. They favor the concentration of the polyphenols, and lead to red wines of higher quality. 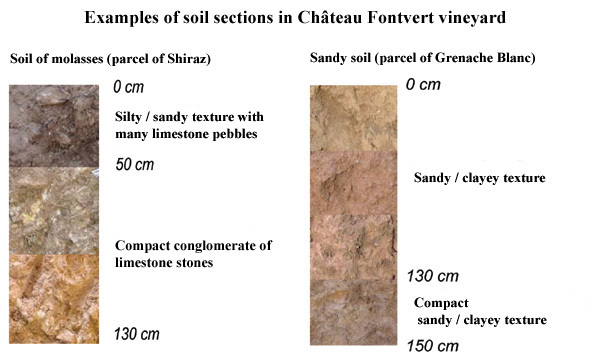 sandy or marly soils. They favor aromatic fineness, optimal for white and rosé wines.